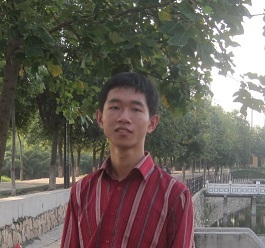 I'm a PHD student in Communication University of China. I have focused on video/audio technics for several years. During these years I made some demos about FFmpeg and other multimedia projects. I share these demos here and wish they can help the beginnner of video/audio technics. FFmpeg Examples can be used in different aspect of video / audio processing. The following picture shows the process of transcoding. It shows the position of these demos during the process of transcoding. simplest_ffmpeg_player: Standard Version, suitable for biginner. simplest_ffmpeg_player_su: SU（SDL Update）Version, Add SDL Event. simplest_ffmpeg_decoder: A decoder that can demux container format. Uses libavcodec and libavformat. simplest_ffmpeg_decoder_pure: A pure decoder. Only use libavcodec (Without libavformat). simplest_video_play_sdl2. Example about using SDL2 play YUV data. simplest_ffmpeg_helloworld: Output informations about FFmpeg libraries. simplest_ffmpeg_audio_player: Audio player based on FFmpeg and SDL. simplest_ffmpeg_audio_decoder: Audio decoder. Uses libavcodec and libavformat. simplest_audio_play_sdl2: Example about using SDL2 play PCM data. simplest_ffmpeg_video_encoder: Simplest video encoder. It uses libavcodec and libavformat. 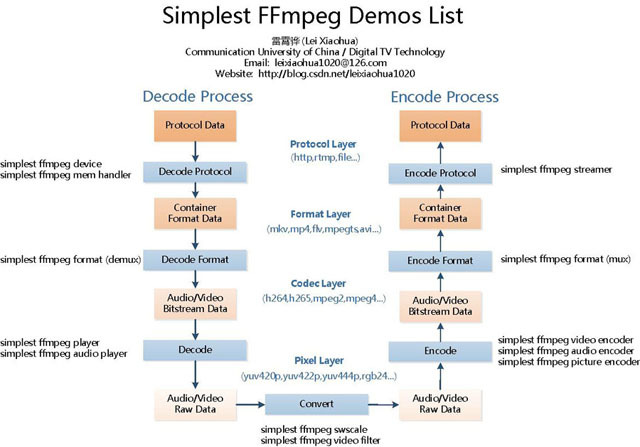 simplest_ffmpeg_video_encoder_pure: Pure video encoder. It only uses libavcodec to encode video (without libavformat). simplest_ffmpeg_streamer: stream local media files to streaming media server. simplest_ffmpeg_receiver: save streaming media to a file. simplest_ffmpeg_mem_player：Video Player that play video data in memory. simplest_ffmpeg_mem_transcoder：Video Converter that convert video data in memory. simplest_ffmpeg_demuxer: Split Audio and Video bitstreams. simplest_ffmpeg_demuxer_simple: Split Audio and Video bitstreams. simplest_ffmpeg_muxer: Put Audio and Video bitstreams together. simplest_ffmpeg_remuxer: Change Container Fomat of Video file. simplest_ffmpeg_video_filter: Put a PNG picture as watermark to a video file, use some libraries such as libavfilter and libavcodec. This project contains examples about handling multi-media data based on FFmpeg on mobile device. simplest_ffmpeg_android_helloworld: Simplest HelloWorld program based on FFmpeg in Android. simplest_ffmpeg_android_decoder: Simplest decoder based on FFmpeg in Android. simplest_ffmpeg_android_decoder_onelib: Simplest decoder based on FFmpeg in Android - One Library. simplest_ffmpeg_android_streamer: Simplest streamer based on FFmpeg in Android. simplest_ffmpeg_android_transcoder: Transcoder transplant from ffmpeg.c in Android. simplest_sdl_android_helloworld: Simplest program based on SDL in Android. simplest_ffmpeg_ios_helloworld: Simplest HelloWorld program based on FFmpeg in IOS. simplest_ffmpeg_ios_decoder: Simplest decoder based on FFmpeg in IOS. simplest_ffmpeg_ios_streamer: Simplest streamer based on FFmpeg in IOS. simplest_ffmpeg_ios_transcoder: Transcoder transplant from ffmpeg.c in IOS. simplest_sdl_ios_helloworld: Simplest program based on SDL in IOS. simplest_ffmpeg_winphone_helloworld: Simplest HelloWorld program based on FFmpeg in Windows Phone. simplest_audio_play_directsound:Play PCM raw audio data using DirectSound. simplest_audio_play_sdl2:Play PCM raw audio data using SDL2. simplest_video_play_direct3d:Play RGB/YUV raw video data using Direct3D's Surface. simplest_video_play_direct3d_texture:Play RGB raw video data using Direct3D's Texture. simplest_video_play_gdi:Play RGB/YUV raw video data using GDI. simplest_video_play_opengl:Play RGB/YUV raw video data using OpenGL. simplest_video_play_opengl_texture:Play YUV raw video data using OpenGL's Texture. simplest_video_play_sdl2:Play RGB/YUV raw video data using SDL2. simplest_librtmp_receive: Receive RTMP streams and save as FLV file. simplest_librtmp_send_flv: Stream FLV file to RTMP streaming server. simplest_librtmp_send264: Stream H.264 raw data to RTMP streaming server. playerGUI: Simplest libVLC Player GUI. simplest_directshow_player_custom: Simplest DirectShow Player (Custom). playerGUI: Simplest DirectShow Player GUI. Note: Some example couldn't work directly. You should upload them to web server such as Nginx or Apache.